This test was pulled from the archives out of the 2004 January issue of MXA. No offense to Kawasaki, Suzuki and KTM, but their combined motocross bike sales don’t equal one-half of the numbers put up by Yamaha and Honda. In the battle for showroom dominance, the CR and YZ are the main players. So, it was only natural that the MXA wrecking crew would take the high-profile, 250cc, two-stroke race bikes of the sales leaders and shoot them out. We don’t pussyfoot around with bike tests. We race them, head-to-head, week-in and week-out, in an attempt to find the answers to the most commonly asked questions. 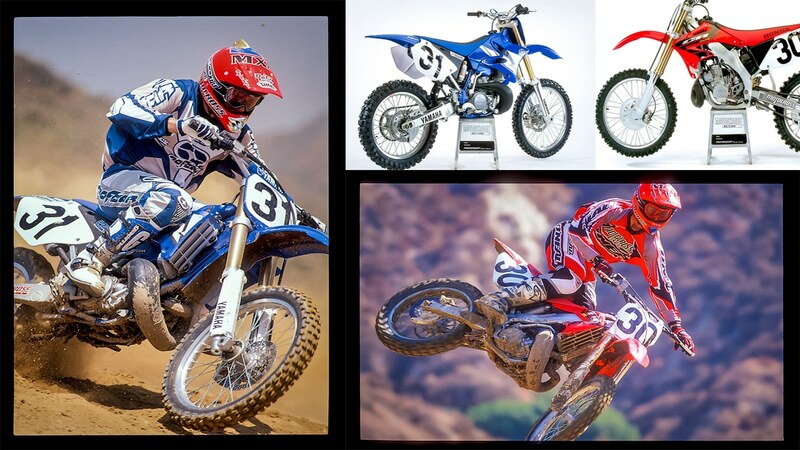 Here is what we have learned about the 2004 CR250 and YZ250. Q: WHICH ONE MAKES THE MOST POWER? 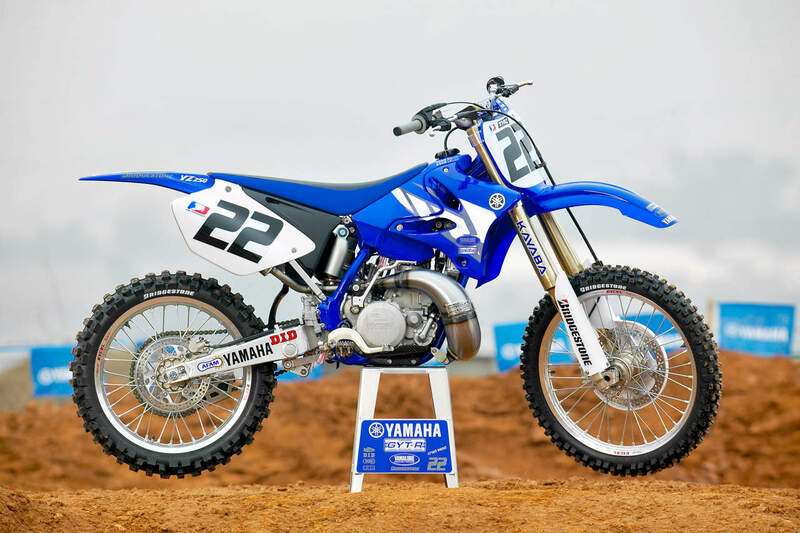 A: The Yamaha YZ250 makes the most horsepower on the track. The YZ250 has an awesome powerband. It is strong on the bottom and strong on top, which, if you read between the lines, means that it isn’t overly impressive in the middle. Guess what? You don’t have to have massive peak numbers in the middle when you romp on the ends. Unfortunately for Honda, the CR250 takes its good old time about building revs, probably because of the confluence of multiple CDI maps, electric power valve lag and an overly generous crankcase volume. Whatever the cause, most test riders couldn’t wait for it. They started keeping the revs up, feathering the clutch and rushing the CR around tight turns with a 125 riding style. Q: WHICH ONE IS THE FASTEST? A: No contest. The Yamaha is stronger, broader and quicker. It jumps out of berms with a growl and keeps on pulling. It is the best 250 two-stroke engine made. No doubt. The Honda CR250 is confused. It is very lethargic from low-to-mid. It doesn’t respond to throttle inputs, unless the bike is at full tilt or the clutch is slipped. Q: WHICH ONE IS EASIER TO RIDE? A: The Yamaha YZ250 wins this category handily, but, even worse, Honda loses this category handily. Honda’s engineers have struggled with the throttle response, pickup and low-to-mid transition ever since going with the case-reed engine design. They are still struggling. A: Need you ask? The YZ250 wins the overall powerband category. Q: WHICH BIKE HAS THE BEST FORKS? A: In stock trim the Yamaha wins this category–because at racing speeds the 48mm Kayaba forks rise to the occasion. Honda’s forks have a soft feel that works very well at low speeds or on relatively smooth tracks. But, for serious racing, the Honda forks need to be stiffened up so that they stay higher in the stroke. With the addition of stiffer fork springs and lower oil height, the CR250 forks offer a plush and resilient feel. The Honda CR250 engine is lethargic from low-to-mid. It doesn’t respond to throttle inputs, unless the bike is at full tilt or the clutch is slipped. Q: WHICH BIKE HAS THE BEST SHOCK? A: Almost every test rider was enamored with the CR250 shock during their first few test rides, but lowered their ratings after racing the CR250. The CR’s luxurious feel when play riding became very dead at speed. It lost some of its plush feel when the bike was pushed to the limit. The YZ250 was just the opposite. When practicing, play riding or taking casual laps, the YZ’s Kayaba shock felt choppy and stiff. Then, on the race track, the YZ shock changed its personality. That stiffness became plushness when the bumps couldn’t be avoided. The MXA wrecking crew races. Thus, we prefer the YZ250 shock. If you don’t race, you’ll prefer the CR250 shock. Q: WHICH BIKE WEIGHS THE LEAST? A: The Honda CR250 is the lightest. At 219 pounds, it weighs four pounds less than the YZ. Q: WHICH BIKE HAS THE BEST BRAKES? A: A push. Yamaha has a better rear brake and Honda has a better front brake. On the Honda we run two brake pad insulators in our rear brakes to keep the heat from boiling the fluid. On the Yamaha we change the stock brake hose for a CR-style brake line. The 2004 Yamaha YZ250 had the best suspension in its class. Q: WHICH BIKES HAS THE BEST GEARING? A: A push. We didn’t feel compelled to change the gearing on either bike, except that tighter tracks might call for one tooth more on both bikes. A: This a Yamaha gimme. The Honda CR250 has terrible shifting. Making the upshift from second to third on the CR250 requires judicious application of boot (and sometimes a touch of clutch). A: A push. Both the YZ250 and CR250 clutches stand out. Which is a good thing for CR owners, because keeping this bike on the pipe requires lots of clutching. 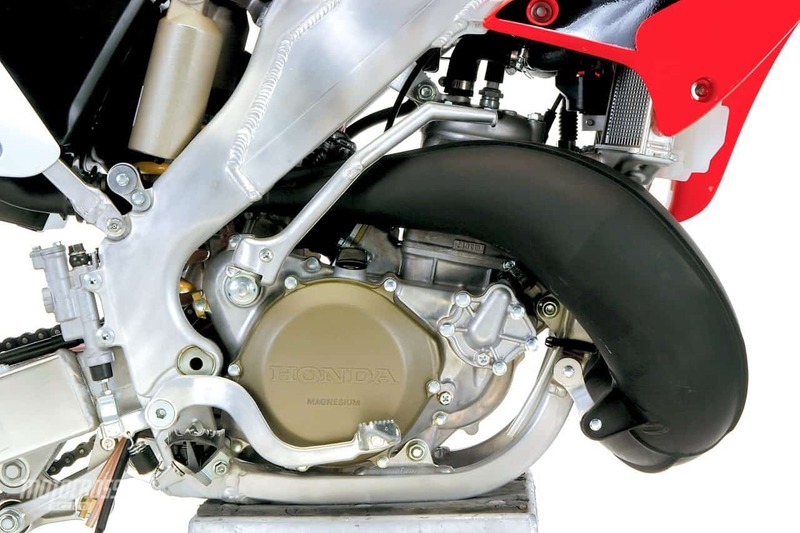 A: Honda loses this category because their filter barely fits into the airbox. 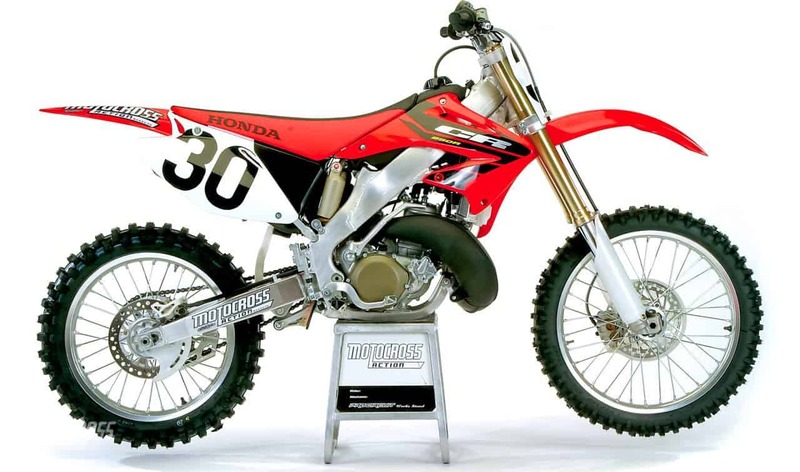 The Honda CR250 was the lightest bike in 2004. At 219 pounds, it weighs four pounds less than the YZ. A: The Honda comes with aluminum Renthal bars. The YZ250 has standard-issue steel handlebars. A: A push. Honda upgraded to an intermediate-type D742/756 combo. Yamaha has opted for a hard-track-style K739 combo—let your dirt decide. 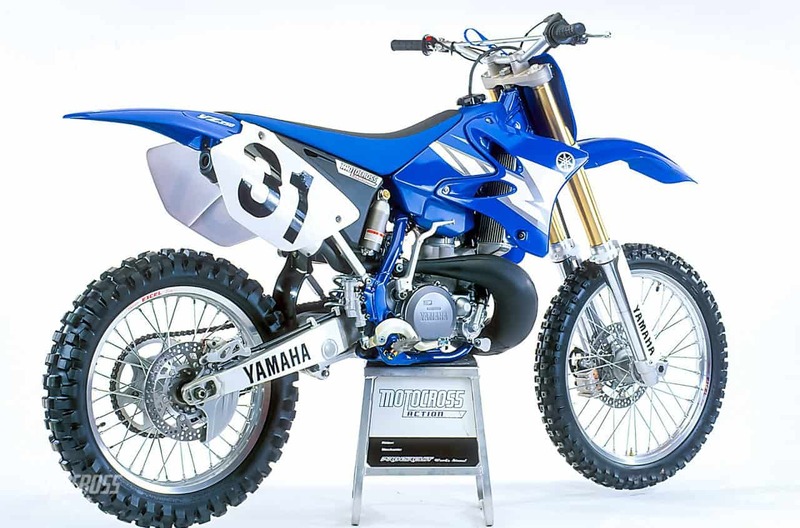 A: The YZ250 and CR250 are completely different machines. The YZ has excellent turn-in control. It tracks like it’s on rails and doesn’t wiggle or wander in mid-corner. The blue bike is also supremely stable in the rough. The CR250 is vague in the corners and very sensitive to the rider’s body position. It has some understeer and a noticeable amount of busyness at speed. That said, the CR250 feels lighter and more agile than the YZ. 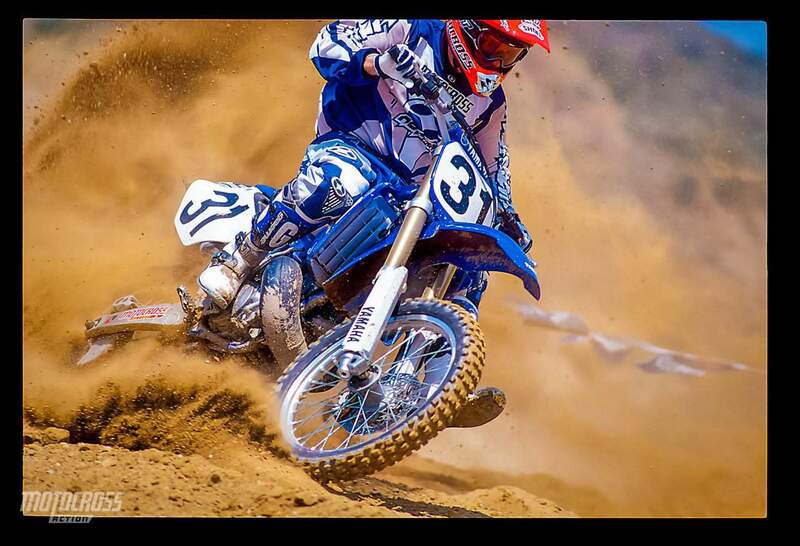 Given our druthers, we prefer the YZ250’s handling traits. Chad Reed went on to win the Supercross championship on his 2004 Yamaha YZ250. It also won MXA’s 250 two-stroke showdown. A: When asked to choose between the 2004 Yamaha YZ250 and the 2004 Honda CR250, the MXA wrecking crew unanimously selected the YZ250. Although the CR’s chassis, suspension, brakes and ergos can be made top-flight, the CR250’s powerband is a deal breaker. It’s lacking.